"Since the 1970's in particular there are waves of very passionate harpers around the country, and indeed outside of Ireland experimenting daily with techniques. I think ultimately what we're all waiting for is a new generation of Irish harpers who are going somehow or other to link back into that original broken spark in the early nineteenth century; and that can only come through a new kind of creativity" Micheal O'Suilleabhain, "Bringing It All Back Home"
Music plays an integral part in the lives of one Mayo Abbey family; the Hambly's of Knockrickard. Gráinne, Niamh, Róisín and their father Michael play a variety of instruments including piano, harp, fiddle, flute, concertina and tin whistle. Indeed these instruments are literally a part of the furniture in the Hambly home; a harp proudly adorns the sitting room. Music in Knockrickard and indeed in Mayo Abbey parish is not confined to the present generation but can be inextricably linked with traditional players of times past whose music and respect for their heritage has left us with a wealth of music, song and dance. The town land of Carrowhall provides an example of this in Thomas Killeen, a blind piper born in the 1820's who is said to have composed the well-known jig "The Lark in the Morning". The Census of 1901 reveals his occupation as a bag-pipe teacher. History has a lot to tell us about older musicians, singers and dancers. We must be ready to listen, research and record this tradition. Mary Hambly's late father and uncle, Pake and Jim Joyce were both good singers and played the accordeon and tin whistle. Gráinne, Niamh and Róisín have fond memories of their grandfather and granduncle and the music they played together. Gráinne's father, Michael, is also an accomplished fiddle player so the tradition comes from both sides of the family. She started playing the tin whistle in 1980 when she was 5 years old. Bernie Geraghty was teaching in Carramore at that time and other families including the Fallons and the Keanes also went for music classes there. Martin Donoghue, Bernie's father also later taught Gráinne as did Marian Egan. Her musical talent was greatly encouraged by her teachers and also by the Claremorris branch of Comhaltas, particularly Mattie Coyne, the branch's chairperson. At home, sessions in the house, as in times past, provided enjoyment, practice and were a great experience. Visiting musicians, the McCalligs, Olivia Galvin, the Molloys, Áine Heneghan and Orla Waldron ensured that there was a great night of music and craic. Competitions for Scór and the various fleadhs required a lot of practice and dedication to achieve the high standards required. Seamus Duffy, one of Gráinne's adjudicators in Scór competitions and an avid Comhaltas member also was a great source of encouragement. He now presents a programme called Fleadh Cheoil on Mid-West Radio. 1986 was the year that the Hambly family went to Miltown Malbay to the Willie Clancy Summer School and it was here that they bought a concertina. Gráinne won the All-Ireland senior competition in Clonmel in 1994 on this instrument. 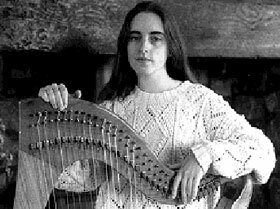 In 1990 at the Glencolmcille Annual Summer School she met Janet Harbison and began playing the harp. After only four years playing the harp she won competitions at Keadue (1994) and Granard (1995) Harp Festivals and the all-Ireland senior harp competition in 1994. Her other interests include Irish dancing, choral singing, horse riding and art. Gráinne's achievements however are not confined to her music, her Leaving Cert results were excellent and she is now studying for a Bachelor of Music degree at Queen's University, Belfast. The degree course at the university combines both practical and theory with an element of traditional music and performance also involved. As one of the original members of the Harp Orchestra Gráinne plays a variety of music both traditional and classical. She is also a member of the National Folk Orchestra. She enjoys the music but also the concerts and recitals and travelling which these involve. Music is a great form of communication and an interesting way of making friends. In 1993 the orchestra played to a capacity audience at Carnegie Hall, alongside the Chieftains; an unforgettable experience. Similarly, the reception and hospitality received on last year's Comhaltas concert tour of Britain was both memorable and enjoyable. Gráinne and the orchestra played in Ballintubber Abbey last Christmas to a capacity audience. She played at St. Colman's Church, Claremorris recently with flautist Patrick Davey during an Organ Recital by John O'Keefe of Maynooth College to mark the rededication of the organ there. She and Patrick were joined by Mícheál O Rúnaí for a concert for Mayo Abbey Development in The Welcome Inn, Castlebar this November. The trio played a variety of traditional music, including many pieces by O'Carolan. Also featured were some newly composed pieces of Patrick's, who is an accomplished composer. The harp is undoubtedly Gráinne's favourite instrument and certainly provides not only a musical challenge but also a great way to see the world. In the past three years the Harp Orchestra have played to audiences in America, France and Germany and over the October weekend embarked on a tour of Britain which took in Liverpool, Leeds and London. Recently Gráinne has become interested in the area of sound technology and the use of computers in music. She also teaches music and has taught in Belfast, Sligo, Glencolmcille and this summer in France. Perhaps the most important aspect of Gráinne's musical talent is the enjoyment which she both gives and takes from it. The versatility which she demonstrates in being able to switch from concertina to harp is remarkable. Most notable though is the obvious love which she has for music and her respect for its traditions and culture. You can find out what Grainne is up to now by checking out her home page.